In: "The Photochemistry of Carotenoids", edited by H.A. Frank, A.J. Young, G. Britton and R.J. Cogdell, published in 1999 by Kluwer Academic Publishers, Dordrecht, pp. 1-19. This chapter presents a personal historical perspective of the role of carotenoids in photosynthesis. It leads the readers into the early literature on the carotenoids and photosynthesis that are related to the discoveries on the excitation energy transfer and to a lesser extent on photoprotection. Excitation energy transfer from the carotenoid fucoxanthin to chlorophyll (Chl) a was shown first in the diatoms by H. Dutton, W.M. Manning and B.M. Duggar, in 1943, at the University of Wisconsin at Madison. After the extensive researches of E. C. Wassink (in the Netherlands) on this topic, the classical doctoral thesis of L. N. M. Duysens became available in 1952, at the State University in Utrecht. This thesis dealt with the evidence of excitation energy transfer in many photosynthetic systems, including anoxygenic photosynthetic bacteria. The experiments of R. Emerson and C.M. Lewis, done at the Carnegie Institute of Washington, Stanford, California, in the 1940s, dealt with the quantum yield action spectra of photosynthesis. In these experiments, the famous red drop phenomenon was discovered; further, the authors showed here the low efficiency of carotenoids in the photosynthesis of both green algae and blue-green algae (cyanobacteria). In 1956, R. Stanier and his coworkers discovered, at the University of California at Berkeley, a special role of carotenoids in protection against death in phototrophic bacteria. Finally, in 1962, H. Yamamoto (of Hawaii) pioneered the role of xanthophyll cycle pigments in photoprotection. This was followed by key experiments and concepts from B. Demmig-Adams (1987, now in Colorado), and O. Bjorkman (at Stanford, California), amongst others mentioned in the text. In 1954, a 515 nm absorbance change was discovered by Duysens (1954) and has now become a quantitative measure of the membrane potential changes in photosynthesis. Historical aspects of some of the basic principles of light absorption and excitation energy transfer, and references to selected current literature are also included in this chapter to allow the reader to link the past with the present. The intent in this chapter is to present a historical perspective of the two major functions of carotenoids in photosynthesis, namely light harvesting and photoprotection, with emphasis on the former. As a novice in both the history of photosynthesis and in the study of the role of carotenoids, I am unencumbered by any bias except that of personal and close associations with (1) Robert Emerson, who, with Charleton M. Lewis, measured the first most precise action spectra of photosynthesis (that included the carotenoid region) in the cyanobacterium Chroococcus (Emerson and Lewis, 1942) and the green alga Chlorella (Emerson and Lewis,1943), and discovered the enhancing effect of light absorbed by the carotenoid fucoxanthin on the quantum yield of photosynthesis sensitized by Chl a of what we now call Photosystem I (PSI) in the diatom Navicula minima (see Emerson and Rabinowitch, 1960; Govindjee and Rabinowitch, 1960; Rabinowitch, 1961); and (2) with Eugene Rabinowitch, who wrote the most detailed single-authored treatise, more than 2000 pages long, on all aspects of photosynthesis including carotenoids, published in 1945 (Vol. I), 1951 (Vol. II, part 1), and 1956 (Vol. II, part 2) (see Bannister, 1972; Brody, 1995). The personal perspective of Duysens (1989) provides an account of the discovery of the two light reactions of photosynthesis, necessary for understanding the context of the present day view of photosynthesis. Retracing historical developments and comprehending the overview of the history of the ideas are essential in grasping the nature of scientific enquiry in any field. From another perspective, I also believe in what Pliny, the Younger (see a translation by Firth, 1909) implied in Book V, Letter V to Nonius Maximus (pp. 224-225) that it is a noble employment to rescue from oblivion those who deserve to be remembered. In writing this chapter, I do not even know if this would be achieved here. I shall attempt to present a view that I consider worthy of thought by the readers of a book that deals with the Photochemistry of Carotenoids. I know that a great many scientists are filled with a glow when they see others citing and recognizing their work; they feel that what they did was indeed useful to society. Everything connected with color has always held, and will continue to hold, a captivating interest for me. The brilliant yellow pigments known as carotenes and xanthophylls are no exception. Carotene was first isolated in 1831 by Heinrich Wilhelm Ferdinand Wackenroder (1798-1854). Berzelius (1837a,b) named the yellow pigments obtained from the autumn leaves xanthophylls (xanthos being Greek for yellow, and phyll for leaf) as a counterpart to chlorophyll, Chl (leaf green). Fremy (1860) reviewed the knowledge on carotenoids at that time. By 1902, however, there were 800 publications in this field (Kohl, 1902). One of the two major yellow pigments present in leaves was found to be identical with the carotene from the carrot root. Xanthophylls were discovered in algae, and one leaf xanthophyll, lutein, was found in egg yolk (for these and other early accounts on the carotenoids, see Lubimenko, 1927 and Smith, 1930). Strain (1938) used the name carotenes for the hydrocarbons, and xanthophylls for oxygenated derivatives of carotenes, but Bogert (1938) suggested that xanthophylls be called carotenols because of their chemical structure and because they were not restricted to leaves. In his famous treatise on photosynthesis, Rabinowitch (1945, 1951, and 1956) adopted the term carotenols; thus, lutein was luteol, violaxanthin was violaxanthol, zeaxanthin was zeaxanthol, etc. We no longer use the ol ending, which is too restrictive, and we are back to the terminology used by Harold Strain. The first separation and purification of the carotenes and xanthophylls must be credited to the Russian botanist Tswett (1906,1911) who invented chromatography for the separation of the leaf pigments i.e. green Chls, and yellow-to-orange carotenes and xanthophylls (also see discussion of paper chromatography by Jensen and Liaaen-Jensen, 1959). Tswett already provided the concept of a family of many pigments, the carotenoids (carotenes and xanthophylls). (See Figure 1, colored, taken from Strain (1938) showing the separation of some of the carotenoids on two systems.) This was followed by the extensive work on the separation and chemistry of the carotenoids by R.Wilstätter (Nobel Prize in Chemistry in 1915, mostly for work on Chl chemistry) (see Wilstätter and Stoll, 1913) although his ideas on the functions of these pigments were not substantiated. Following these early days, research on the carotenoids was reviewed by Palmer (1922), Zechmeister (1934, 1962), Lederer (1934), Karrer and Jucker (1948, English translation, 1950), Goodwin (1952, 1976), Cogdell (1978; 1985: for interactions with Chls), Britton and Goodwin (1982), Cogdell and Frank (1987), Mimuro and Katoh (1991), Britton et al. (1995) and Bartley and Scolnik (1995). Nobel prizes in Chemistry were successively awarded to Paul Karrer (in 1937) and Richard Kühn (in 1938) for their work on the structure and chemistry of the carotenoids. A book edited by Isler (1971) was dedicated to the memory of Paul Karrer. Kühn (1935) showed that the carotenoids absorb in the visible (at about 480 nm) due to the alternation of single and double bonds, which produces a so-called Brillouin gap when one resonance structure is dominant. It was Karrer, however, who had recognized the symmetrical nature of the various carotenoids (b -carotene; lycopene; zeaxanthin) and that vitamin A was related to half of the b -carotene molecule (see Karrer,1934; Karrer and Helfenstein, 1933). The nomenclature at that time was summarized by Palmer (1934). By 1948, about 80 carotenoids were known, and structures of about half of those were established; by 1950, total synthesis of b carotene was achieved by Karrer and others. For chemistry of carotenes, see McKinney (1935), Liaaen-Jensen (1978), and Packers two volumes (1992a, 1992b); for antheraxanthin, see Karrer and Oswald (1935), for spirilloxanthin, see van Niel and Smith (1935), for xanthophylls of algae, see Strain et al. (1944), and for carotenoids in cyanobacteria, see Hirschberg and Chamowitz (1994). For rules on the nomenclature of carotenoids, see IUPAC and IUB (1971, 1975). Karrer and Jucker (1948), when dealing with the function of carotenoids, wrote "All these investigations are still at a preliminary stage and further researches will be required in order to elucidate the importance of carotenoids in plants." Similarly, Goodwin (1952) stated " with regard to formation and function (of carotenoids), knowledge is rudimentary". However, by this time Dutton and Manning (1941) in Wisconsin had already shown that light energy absorbed by fucoxanthin was used efficiently for photosynthesis in the diatom Nitzschia closterium, and Dutton et al. (1943) had clearly established that this process took place by transfer of energy absorbed by fucoxanthin to Chl a, because excitation of fucoxanthin led to Chl a fluorescence (i.e., the phenomenon of sensitized fluorescence was observed). This was a clear case of the light-harvesting function of one of the carotenoids in vivo (also see Dutton, 1997). Further coverage of the history on this topic will be presented in section II of this chapter. Carotenoids are known to have another major function, i.e. that of photoprotection of reaction centers, pigment-protein antennae, and cells and tissues (see Krinsky, 1968, 1979). The work of Roger Stanier and his coworkers provided the most compelling evidence for the belief that carotenoids perform a photoprotective function. In 1955, Griffiths et al. discovered that a blue-green (BG) mutant of the non-sulphur purple bacterium Rhodopseudomonas (now Rhodobacter) sphaeroides, which is deficient in colored carotenoids, is photosensitive in the presence of air. The mutation was lethal. It was suggested that carotenoids are universally associated with photosynthetic systems because they protect these systems against photodynamic damage catalyzed by bacterioChl (in photosynthetic bacteria) or by Chl (in plants and algae). More recently, a third function was discovered: in higher plants exposed to strong light. Zeaxanthin and antheraxanthin, formed from violaxanthin by the xanthophyll cycle (Yamamoto et al., 1962) increase non-radiative dissipation of energy as heat in the pigment bed of the antenna of Photosystem II (PSII) (Demmig et al., 1987; Gilmore et al., 1995). Further discussion on this topic will be presented in section IV of this chapter (also see Horton et al., 1994, Demmig-Adams et al., 1996; Yamamoto and Bassi, 1996; Gilmore, 1997). The reader is referred to Sieferman-Harms (1987a,b) for earlier discussions on the light harvesting and photoprotective functions of carotenoids. Pigment excitation occurs after the absorption of light. This promotes the molecule from the ground state (So) to an excited state (Sn). All further reactions occur after de-excitation of this higher excited state. This upward transition occurs in 1-2 fs in visible light. A historical suggestion was that of James Franck (1925, who had shared, with Hertz, the 1925 Nobel Prize in Physics for the experimental verification of the quantum theory). He argued simply that because of the large masses of the nuclei in a molecule, their relative momentum cannot be directly affected by an electronic transition, so that those transitions will be most likely that conform most closely to a Principle. The nuclei do not move during an electronic transition. Thus, on a diagram of energy (ordinate) versus distance between the nucleii of a diatomic molecule (abscissa), this transition is vertical promoting the electron from the lowest vibrational state of a molecule in the ground state to a higher vibrational state of the excited state (e.g. S1 or S2) of the molecule (Figure 2). The molecule in the excited state then dissipates immediately (within 10 to 100 fs) some energy as heat and the electron reaches the lowest vibrational level of the excited state. When the molecule relaxes to the ground state giving off light (fluorescence), it generally occurs at longer wavelength than the absorbing wavelength (Rotverschiebung, the red shift, Franck, 1927). The Franck-Condon principle, then, explains the observed red shift (Stokes, 1852) of the fluorescence spectrum from the absorption spectrum. The history of how the principle became known as the Franck-Condon principle was beautifully presented by Condon (1947). The original idea is in a paper at a Faraday Society meeting in London by Franck (1925); the proofs of this paper were sent to his student Hertha Sponer, who was then at the University of California at Berkeley on an International Education Board Fellowship. She generously shared the proofs with Condon; he was able to generalize Francks ideas (Condon, 1926). Condon (1947) states:"This work was all done in a few days. Doctor Sponer showed me Francks paper one afternoon, and a week later all the quantitative work for my 1926 paper was done." With carotenoids, one does not usually observe by conventional absorption spectroscopy, transitions involving the first singlet excited state, (S1) but mainly the second singlet state (Bu or S2). The transition from the So state to S1 is optically forbidden (for a fuller discussion, see Chapter 8, this volume; also see a review by Koyama, 1991). Fluorescence of carotenoids in general is very weak (S1 to S0 transition). The first major function of carotenoids is to act as an accessory pigment, i.e., to capture light and transfer the energy to Chl a to drive photochemistry. The methods used to obtain evidence for this are basically two: (1) measurement of action spectrum of photosynthesis in the region carotenoids and Chls absorb and evaluation of the quantum efficiency of light absorbed by carotenoids in photosynthesis; and (2) measurement of action spectrum of Chl a fluorescence in the region where carotenoids and Chls absorb and evaluation of the quantum efficiency of excitation energy transfer from the carotenoids to Chl a. The latter technique is called the sensitized fluorescence method. 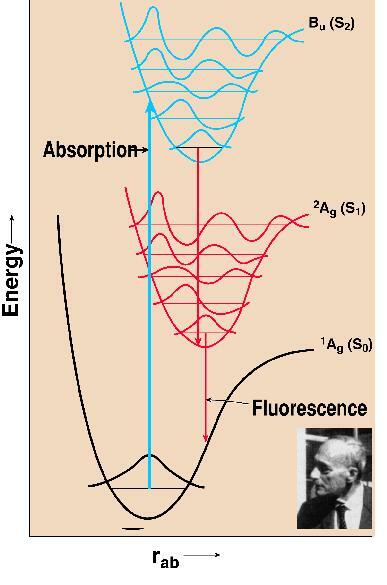 If the energy donor is fluorescent, one would observe decreases (quenching) in donor fluorescence and increases in acceptor fluorescence when the donor is excited, whereas excitation of the acceptor would lead to acceptor fluorescence only; this method was first applied by Cario and Franck (1923) in gases. Since then it has been successfully used in liquids, solids, proteins and photosynthetic systems (see e.g., Knox, 1975; Stryer, 1978; Pearlstein, 1982; van Grondelle and Amesz, 1986; Frank et al., 1991; van Grondelle et al., 1994). Engelmann (1883, 1884) was an ingenious scientist (see Kamen, 1986). He projected the visible spectrum on to green, red and brown algae, mounted on the stage of a microscope, and used the number of aerotactic motile bacteria accumulating in the different wavelengths of the light as an indication of the rate of oxygen evolution. He concluded that light absorbed by various accessory pigments (including carotenoids, particularly fucoxanthin) was used for photosynthesis. Warburg and Negelein (1923), using precise manometric methods, measured absolute quantum yields of oxygen evolution by the green alga Chlorella in different colors of light. Although the absolute quantum yield of oxygen evolution in blue light, where both carotenoids and Chls absorb light, was later questioned by others, it was slightly lower than in the red where only Chls absorb light. Thus, this experiment indicated that, although carotenoids contribute to photosynthesis, their efficiency is somewhat lower than that of Chls. It was Montfort (1936, 1940) who compared, although rather crudely and from unreliable experiments, absorption by various extracted photosynthetic pigments and oxygen evolution in various colors of light, and concluded that light absorbed by fucoxanthin of marine brown algae is fully utilized in photosynthesis. The first extensive and reliable measurements on the quantum yield of oxygen evolution as a function of wavelength of light (i.e., of the action spectrum of photosynthesis) were, however, carried out by Emerson and Lewis (1942, 1943) on the cyanobacterium Chroococcus and the green alga Chlorella (see Figure 3). These experiments were done with a large home-built monochromator with the grating obtained from Mt. Wilson observatory and the use of the most precise manometry, where 0.01 mm pressure changes, due to oxygen evolution, could be measured! Independent of Emersons work, Dutton and Manning (1941) carried out similar experiments with the diatom Nitzschia closterium (now Phaeodactylum tricornutum), using a dropping mercury electrode. Their conclusions were that fucoxanthin in the diatom is almost 90% efficient, whereas the carotenoids are about 40-50% efficient in Chlorella, and much less efficient (perhaps, only 10%) in Chroococcus. Although Wassink and Kersten (1945,1946) came to the same conclusion as Dutton and Manning (1941), it was Tanada (1951), a student of Emerson, who provided the most thorough and precise data. He used the Emerson-Lewis monochromator, and showed a very high quantum yield of oxygen evolution at 500 nm, where fucoxanthin absorbs most of the light (see Fig. 4). On the other hand, Haxo and Blinks (1950) made a large number of action spectra of photosynthesis plotted per incident photons in many marine algae, but were able to make only qualitatitive statements regarding energy transfer from carotenoids to Chl a. They concluded that carotenoids were relatively inactive in the green alga Ulva, but considered that some carotenoids must be active in photosynthesis in some systems. For a review on the action spectra of photosynthesis, see Fork and Amesz (1969). Measurements on the action spectra of photosynthesis do not distinguish between the direct photochemistry by the carotenoids versus that by Chl a after excitation energy transfer from them to the Chls. This distinction is possible only from measurements on excitation energy transfer. Vermeulen et al. (1937), in the laboratories of L. S. Ornstein of Utecht and A. J. Kluyver of Delft, published their results on the intensity of fluorescence per quantum absorbed as a function of wavelength of light for the green alga Chlorella. Although the measured quantum yields of Chl a fluorescence were too low to be true, the yield of Chl a fluorescence after excitation by 496 nm light was about 20% lower than after excitation at 607 nm. The authors stated that both the quantum yield of the Chl a fluorescence and that of photosynthesis (Warburg and Negelein, 1923) was independent of wavelength in the region where only Chl a absorbs. Since the data show 10-30% decreases in the blue (see Vermeulen et al, Table III), we can conclude that carotenoids did not transfer 100% of their excitation energy to Chl a although the authors did not make any comment on this problem. The first and clear evidence for excitation energy transfer from fucoxanthin leading to Chl a fluorescence was obtained by Dutton et al. (1943). It was demonstrated that light absorbed by fucoxanthin was almost 90% as efficient in producing Chl a fluorescence as was light absorbed by Chl a itself. This was the clearest pioneering paper dealing with sensitized fluorescence evidence for excitation energy transfer in photosynthesis (see Dutton, 1997, for the experimental background prior to the actual experiment). Excitation energy transfer, in general, in photosynthesis was implied already in the paper of Gaffron and Wohl (1936) when they were explaining the photosynthetic unit experiments of Emerson and Arnold (1932a,b). Further, Oppenheimer (1941) had called it internal conversion while thinking about the still earlier unpublished experiments of William Arnold (see Knox, 1996, for the history of this work, as well as Arnold and Oppenheimer, 1950). Wassink and Kersten (1946) confirmed the conclusion of Dutton et al. (1943) on excitation energy transfer from fucoxanthin to Chl a. Although Van Norman et al. 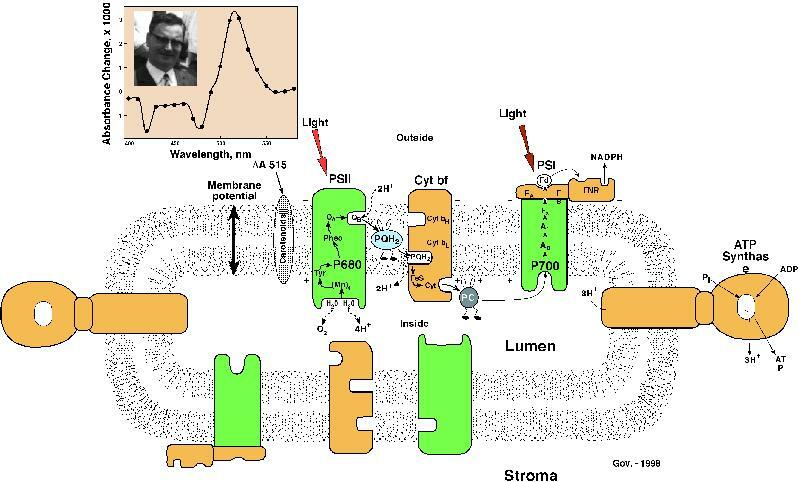 (1948) did not really discuss excitation energy transfer from phycoerythrin (a phycobilin, not a carotenoid) to Chl a in the red algae they had examined, it was clear that the higher yield of red fluorescence by excitation with green light, absorbed by phycoerythrin, than by red light, absorbed by Chl a, suggested efficient excitation energy transfer from phycoerythrin to Chl a. Excellent evidence for this transfer was published by French and Young (1952), and was known to and fully recognized by L. N. M. Duysens (1951, 1952). No discussion of energy transfer from carotenoids to Chl a is available in the papers of French and coworkers. The classical work of Duysens (1951, 1952) established that: (1) carotenoids transfer 35-40% of their absorbed energy to bacterioChl a in the B890 complex of Chromatium strain D, and about 50% to bacterioChl a in the B890 complex of Rhodospirillum molischianum; (2) about 40% of energy absorbed by carotenoids is transferred to Chl a in green algae; and (3) about 70% of energy absorbed by fucoxanthin is transferred to Chl a in diatoms and brown algae. In none of the early experiments, except for the work on fucoxanthin, was any distinction made between carotenes and xanthophylls. 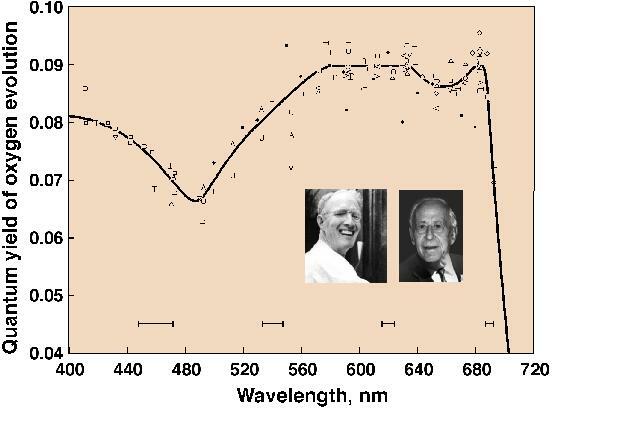 In 1956, Arnold and Meek presented their work on the depolarization of Chl a fluorescence (see Perrin, 1926, 1929), thus supporting clearly the concept of excitation energy migration in photosynthesis. To me, this was an important experiment of its time. When I joined the research group of Robert Emerson in 1956, Emerson was very keen that I work on the problem of the separate roles of carotenes and xanthophylls in photosynthesis. I grew several types of algae (Tribonema; Muriella; Tolypothrix) in different colors and intensities of light and extracted carotenes and xanthophylls and monitored the variations in the ratios of the two groups of carotenoids under various experimental conditions. Unfortunately, for me, Emerson was not interested in measuring action spectra of Chl a fluorescence, but was only interested in measuring quantum yield action spectra of photosynthesis, an art he had perfected. The progress on my research was extremely slow due to my impatience, the tedious nature of manometry and difficulties in measuring absolute quantum yield of photosynthesis in low intensities of different wavelengths of light. My work was never finished in spite of piles and piles of data I had collected. (I moved on to other research after Emersons death on February 4, 1959.) However, Goedheer (1969a,b; see his review, 1972), also from the same laboratory as Duysens, published a paper on chloroplasts treated with petroleum ether (this treatment selectively removes carotenes, not xanthophylls) and concluded that, in red algae and in cyanobacteria whose phycobilins he had also removed, b carotene transfers energy to Chl a (of PSI with 100% efficiency, whereas the b carotene of green algae and greening leaves transfers energy to Chl a of both PSI I and II. Surprisingly, Goedheer concluded that xanthophylls in these organisms do not transfer any energy to Chl a. The observed peaks for the carotenoids were at 471 nm and 504 (or 506) nm, at 77K in the action spectra of Chl a fluorescence. I believe there is a need for further research on this topic in intact systems without such solvent treatments, as used by Goedheer. There is, however, evidence that lutein, a xanthophyll, transfers energy to Chl a with 100% efficiency in the isolated light harvesting complex (LHC) of Lactuca sativa (see Siefermann-Harms and Ninnemann, 1982). Although many authors state that violaxanthin transfers excitation energy to Chl a, Barrett and Anderson (1980) could not detect any significant excitation energy transfer in the green Chl a/c-violaxanthin protein from the brown alga Acrocarpia paniculata. After I finished my PhD under Eugene Rabinowitch and had established that Chl a was in both the photosystems (Govindjee and Rabinowitch, 1960) and that Chl a fluorescence measurements can be used to support the existence of two light reactions and two photosystems (Govindjee et al., 1960, Duysens, 1989), I went back to measure the action spectra of Chl a fluorescence, but not so much from the point of deciding the role of carotenoids in photosynthesis, but of simply using Chl a fluorescence as an intrinsic, sensitive, and non-invasive probe of photosynthesis (see Govindjee, 1995). A major interest was in using temperature dependence of fluorescence down to liquid nitrogen and helium (4K) temperatures. 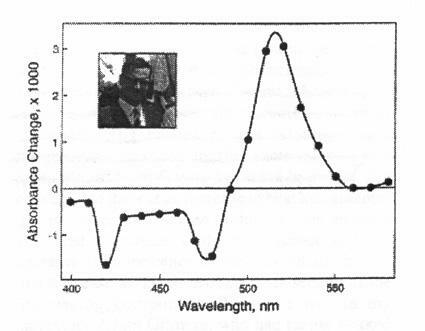 Figure 5 (Cho and Govindjee, 1970a) shows the absorption spectra and action spectra of Chl a fluorescence in the green alga Chlorella pyrenoidosa at 77 and 4K. Several bands can be observed including the one at 491 nm from carotenoids. Excitation energy transfer from carotenoids to Chl a is clearly indicated, but no further information is available. With the blue-green alga (cyanobacterium) Anacystis nidulans, bands at 472 nm and 505 nm, due to carotenoids, are observed (Figure 6, Cho and Govindjee, 1970b; also see Kramer et al., 1981, for similar data on spinach and barley) in the action spectra of Chl a fluorescence, again showing energy transfer from carotenoids to Chl a. In grana and stroma lamellae fractions from thylakoids, Gasanov et al. (1979) calculated the efficiency of excitation energy transfer from the carotenoids (without distinction between carotenes and xanthophylls) to Chl a (Figure 7). It appears that there are two pools of carotenoids, one absorbing at shorter wavelengths and transferring energy to Chl a with an efficiency of about 40-50% and another at slightly longer wavelengths transferring energy, with an efficiency of about 20-25%. This conclusion has never been confirmed or pursued, and the question of the precise roles of carotenes and xanthophylls in light harvesting remains still an open question worthy of research. It was already known in the nineteenth century that a part of another carotenoid (peridinin) is bound to a protein in vivo in dinoflagellates (Schuett, 1890). The excitation spectrum of Chl a fluorescence in the chromoprotein from Amphidinium carterae, obtained by Haxo et al. (1976), showed that light absorbed by peridinin is transferred efficiently to Chl a. Song et al. (1976) showed 100% efficiency of energy transfer from peridinin to Chl a in Chl a-proteins of two dinoflagellates, a Glenodinium sp. and Gonyaulax polyedra. Further, efficient energy transfer has been reported from siphonaxanthin (absorbing in the green region) to Chl a in the thalli of the green algae Ulva japonica and Ulva pertusa (Kageyama et al., 1977) and in the isolated green protein, containing siphonaxanthin, from Codium (Anderson, 1983; also see a review by Govindjee and Satoh, 1986). As already mentioned, evidence for excitation energy transfer to Chl a was established, first from fucoxanthin and then from peridinin, as well as from b -carotene. This raises question of how excitation energy moves from one molecule to another. In 1940, William Arnold had observed excitation energy transfer from phycocyanin to Chl a and had discussed it with JR Oppenheimer (see Arnold, 1991, p. 77). Knox (1996) has traced the history of Arnolds contribution; he states that the R-6 dependence of excitation energy transfer (to be evolved later by Förster) must have been evident to Oppenheimer in whose 1941 paper the conclusion of Arnold and Oppenheimer (1950) was already stated. There are two major theories for exciton transfer: (A) Försters resonance energy transfer mechanism (Förster, 1946,1948, 1965) (called the Heller-Marcus mechanism in the crystal field) that depends upon the transfer of excitons where the decay of the excited state in the donor molecule is coupled with the upward transition promoting the ground state of the acceptor to the excited state. Energy (i.e., hole and electron together) is transferred from one molecule to the other. This mechanism is based upon a dipole -(induced) dipole interaction and includes the following: (1) an R-6 dependence of energy transfer, where R is the distance between the donor and the acceptor; (2) an appropriate orientation of the dipoles for a efficient transfer; and (3) a good proximity of the energy levels, as measured usually by the overlap integral of the absorption spectrum of the acceptor molecule and the fluorescence spectrum of the donor molecule (see e.g., Knox, 1975; van Grondelle and Amesz, 1986). [The R-6 dependence was clearly proven in in vitro by studying excitation energy transfer from an a - naphthyl group at the carboxyl end of a polypeptide to the energy acceptor dansyl group at the amino end, when the distance was changed by spacers of oligomers of poly-L-proline (Stryer and Haugland, 1967).] (B) Dexters electron exchange mechanism (Dexter, 1953); here, there is electron exchange, i.e., the movement of an electron from the LUMO (lowest unoccupied molecular orbital in the ground state) in the donor molecule to the vacant LUMO in the acceptor simultaneous with the movement of the electron from the HOMO (highest occupied molecular orbital) of the acceptor molecule to the vacant HOMO of the donor molecule (called the Wannier mechanism in the crystal field). This mechanism requires extremely close proximity of the donor and acceptor molecules. The energy level diagram (the Jablonski diagram, see Jablonski, 1935) shows that the energy level of the optically allowed Bu (S2) state of the carotenoid molecule is higher than the S2 level of Chl or BChl. In general, however, the lifetime of the S2 state of the molecules is too short and most of the de-excitation occurs by loss of heat and the attainment of the S1 state. There are, however, reports that excitation energy transfer may be possible originating from S2 (see e. g., Chapter 8, this volume). The consensus is that the lower level of carotenoids is expected to be involved in excitation energy transfer. Now, since the 2Ag (S1) to Ag (S0) is optically forbidden, it has been suggested that the singlet energy transfer reaction, involving the S1 states, must take place through the electron exchange mechanism. For a review see Frank and Cogdell (1993). I consider it interesting to mention an old idea of Platt (1959) who predicted that energy can be transferred from carotenoids to Chls, but entertained the possibility of energy transfer from Chl to a charge-separated state involving carotene. He had predicted large red shifts from an absorption at 480 nm, to the orange-red region, and then to 1100 nm for various states of carotenes. No one since then has provided any specific experimental support for Platts ideas. An outline of the history of the role of carotenoids in photosynthesis would certainly be incomplete without a discussion of the so-called 515 nm effect (D A 518 as some call it). When a pigment is placed in an electric field, its absorption spectrum is shifted because the field changes the energy levels of the pigment. This is so-called Stark effect. During photosynthesis, electrons are transferred from one side of the thylakoid membrane to the other side since the primary electron donors (P680, P700, P870, etc) are located on one side and the stable electron acceptors on the other side (Figure 8). This produces a membrane potential (electric field). Thus, the light-absorbing properties of the pigments present in the membrane are then affected as a result of the Stark effect; this produces what we call electrochromism. Carotenoids are affected in this way and are responsible for a major portion of the absorption change (D A 515 or D A518). A positive absorbance change around 515 nm was discovered in the green alga Chlorella, in a leaf, in the thalllus of a marine alga, and in the blades of Valisneria. (Figure 9) by Duysens (1954) when he was a visiting fellow at the Carnegie Institute of Washington at Stanford, after his brief stint as a fellow at the UIUC, Urbana, Illinois, with Eugene Rabinowitch. This positive change was accompanied by negative changes at 480 nm and 420 nm; the latter was assigned to cytochrome f. It was Strehler (1957) who suggested its relationship to carotenoids (also see Govindjee and Govindjee, 1965). Wolff et al. (1969), in the laboratory of H.T. Witt, pioneered the relationship of the 515 nm change to the fast charge separation processes at the reaction centers because they observed that the change occurred within nanoseconds after a flash of light. It was later shown by HT Witt and coworkers that about 50% of the fast change arises from PSI and the other 50% from PSII (see e.g., a review by Witt, 1975). According to the chemiosmotic hypothesis of Peter Mitchell (1961), proton motive force (i.e., D pH and D Y ) is used to produce free ATP. The 515 nm change was found to decay faster in the presence of gramicidin D, an uncoupler of photophosphorylation, as expected if the change is a monitor of membrane potential (Junge and Witt, 1968). I note that in this paper, the authors assumed that they were monitoring changes only in Chl b at 515 nm. Jackson and Crofts (1969) made another important observation in bacteria. They found a shift in the carotenoid spectrum (523 minus 509 nm absorbance change) in darkness when a potential is generated that is positive with respect to the inside of the chromatophores; the shift mimicked that observed as a response to light. De Grooth et al. (1979) observed a flash number dependency of the biphasic decay of the electrochromic shift of the carotenoids, related to the changes in the membrane potential, in the chromatophores of Rhodobacter sphaeroides. The carotenoid absorbance change is accepted now to be a monitor of the membrane potential. The hypotheses to explain how carotenoids play a role in protecting plants against damage by excess light have been discussed very extensively. Crucial work on the topic of photoprotection was done in the summer of 1954 in C. B. van Niels Lab at the Hopkins Marine Station by Roger Stanier and his colleagues (see Griffiths et al.,1955; Sistrom et al., 1956; Stanier, 1960; the participation of Germaine Cohen-Bazire in this work was acknowledged). Based on experiments with a blue-green mutant of Rhodopseudomonas (now Rhodobacter) sphaeroides that contained no colored carotenoids, it was suggested that "the primary function of carotenoid pigments in phototrophs is to act as chemical buffers against photooxidation of other cell constituents by (B)Chl, thus conferring a high degree of immunity to endogenous photosensitization." The mutant was unable to live normally. The mechanism of action was shown later to involve removal of singlet oxygen by carotenoids, and the formation of triplet states of carotenes (see reviews by Krinsky, 1968, 1971). We shall not discuss this function further. However, we note that Mimuro et al. (1995) have detected two b -carotene molecules in the reaction center of PSII by fluorescence and linear dichroism spectroscopy. 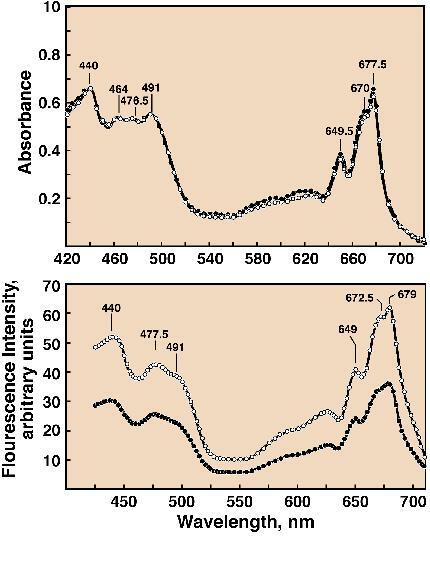 It was shown that the two b -carotene molecules in the reaction center of PSII are spectrally different and transfer excitation energy to Chl a at 77K; one has an absorption band at 489 nm, and the other has bands at 506 and 467 nm. It is assumed that these b -carotene molecules must function to protect the reaction center Chls from damage. (see e.g., Telfer et al., 1994). Further, recently, Trebst and Depka (1997) have shown that b -carotene is essential for the assembly of the D1 protein into functional PSII. One of the several mechanisms by which plants protect themselves against excess light is by dissipating excess energy as heat through the participation of the xanthophyll cycle and the pH gradient (see reviews by Horton et al., 1994, 1996; Demmig-Adams et al., 1996; Demmig-Adams and Adams, 1996; Gilmore, 1997; Gilmore and Govindjee, 1999, and Chapters 14 and 15, this volume). De-excitation of a molecule, excited by light, occurs by fluorescence, heat, excitation energy transfer, or photochemistry. At high light intensities, when photosynthesis is saturated, unusual photochemistry can take place that can lead to damage of the photosynthetic apparatus. This could be avoided if there were a mechanism to increase energy loss as heat or fluorescence. However, during exposure of plants to high light, Chl a fluorescence intensity has been shown to decrease (fluorescence quenching). One of the current suggestions is that excess light somehow promotes the formation of zeaxanthin from violaxanthin, with antheraxanthin as an intermediate. It is now generally believed that it is mostly zeaxanthin (or antheraxanthin) that removes the excess energy from the excited Chls and loses this energy as heat. The history of the xanthophyll cycle goes back to Sapozhnikov et al. (1957), who first observed that violaxanthin levels changed in light/dark or high light/low light treatments in Sakhlin buckwheat (Polygonum sacchalinense F. Schmidt), in cyclamen (Cyclamen persicum L), broad bean (Vicia faba L.) and medicinal dandelion (Taraxacum officinale L s.l). They thought that violaxanthin was converted into lutein and speculated on the possibility that this may have significance for oxygen evolution in photosynthesis. Yamamoto got involved at this stage and it was he who discovered the currently accepted stepwise and cyclical pathway, now known as the xanthophyll cycle (Yamamoto et al., 1962; also see Yamamoto, 1979). The stepwise pathway excluded the possibility of involvement in photosynthetic oxygen evolution. Further, the kinetics was too slow and Yamamoto showed soon thereafter that the effect of light was indirect. There have been many other researchers in this field that are also currently active. It was Barbara Demmig, Olle Björkman and their coworkers (see Björkman,1987; in this paper the author mentions two unpublished manuscripts of Demmig and Björkman; Demmig et al., 1987: work done in the pharmaceutical laboratory of Professor Czygan; Björkman and Demmig-Adams, 1994) who suggested that the excess energy is lost as heat in the antenna complexes, and related the phenomenon to the xanthophyll cycle. Barbara.Demmig-Adams (in a recent personal note to me) also credits Professor Lichtenthaler's earlier papers relating Chl a fluorescence changes to the xanthophyll cycle. The concept that there is an increase in heat loss assumes that the observed decrease in fluorescence intensity is indeed a decrease in the fluorescence yield. A decrease in fluorescence intensity could also be due to a decrease in the absorption cross-section of the fluorescing component. While he was in my laboratory Adam Gilmore, who had earlier worked with Harry Yamamoto and Olle Björkman, made the measurements on the lifetime of Chl a fluorescence that directly measures the quantum yield of fluorescence (Gilmore et al., 1995, 1996,1998). We established that in thylakoid samples there is a dimmer switch in which the fraction of a long-lifetime component (a 2 ns component) of fluorescence decreases with a concomittant increase in the fraction of a short-lifetime fluorescence component (a 0.4 ns component). The latter component was suggested to have increased dissipation of energy as heat because, in these experiments, photochemistry was blocked by the use of a herbicide, diuron. 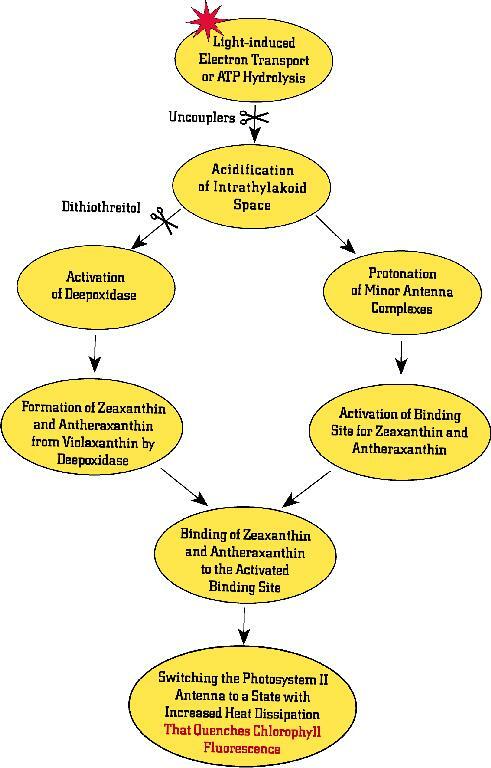 It is also now clear that both a proton gradient (or a low internal pH) and the presence of zeaxanthin (or antheraxanthin) are required for this process. The protons are suggested to have a dual role: (i) activation of de-epoxidase that leads to increased conversion of violaxanthin into zeaxanthin, and (ii) conformational changes that lead to efficient binding of zeaxanthin or (antheraxanthin) on antenna complexes where dissipation of energy as heat takes place (Figure 10). Whether the heat loss occurs via zeaxanthin directly, as stated above, or is induced in Chl by association with zeaxanthin remains an open question. The possibility that S1 state of zeaxanthin (that has not yet been directly observed) lies below the S1 state of Chl a (Frank et al. 1994; Owens, 1996) is a grand and a reasonable hypothesis. It makes it easy to accept that Chl a can transfer excitation energy to zeaxanthin. Several investigators have now established that the photoprotection mechanism need not require light-harvesting complex IIb (see e.g., Gilmore et al., 1996; Briantais et al., 1996). Thus, it was suggested that the inner antenna complexes are involved. Bassi et al. (1993) have shown that the xanthophyll-cycle pigments are preferentially associated with the inner antenna Chl a complexes (CP) 26 and 28. This idea was elegantly supported by Crofts and Yerkes (1994) when they compared the amino acid sequences of the various light harvesting complexes (LHCIIb, CP26, CP28, etc). Current research on the mutants of Chlamydomonas reinhardtii and Arabidopsis thaliana, that are blocked in the interconversions of the xanthophyll-cycle pigments, are providing information on the molecular mechanism of the photoprotection process (see e.g., Niyogi et al., 1997a,b, 1998; Pogson et al., 1996, 1998). A possibility has been raised that lutein may also be important in the mechanism of photoprotection in Chlamydomonas, but not in Arabidopsis. What is certain is that both b -carotene and the xanthophyll fucoxanthin transfer excitation energy to Chl a; b -Carotene, in addition, protects against photochemical damage of the reaction centers, and the xanthophyll zeaxanthin protects plants against excess light by initiating reactions, in combination with those initiated by pH gradient, that lead to loss of excess energy as heat. Much research is needed to prove the roles of other carotenoids (e.g., lutein, violaxanthin, and others). It is however currently assumed that violaxanthin acts as a light harvester, i.e., transfers energy to Chl a, and that lutein may indeed substitute for zeaxanthin in some systems. Research on both the mechanism of excitation energy transfer from Chls to carotenoids and vice versa is ongoing. The availability of structures at atomic levels is certainly important for this purpose. For example, the atomic level structure of the reaction center of photosynthetic bacteria shows a carotenoid (1,2-dihydroneurosporene). (Deisenhofer and Michel, 1989). In addition, the peridinin-Chl a complex from Amphidinium carterae also shows precisely where the carotenoid peridinin is located in this antenna complex (Hofmann et al., 1996; see the colored photograph, Figure 11). Kühlbrandt et al. 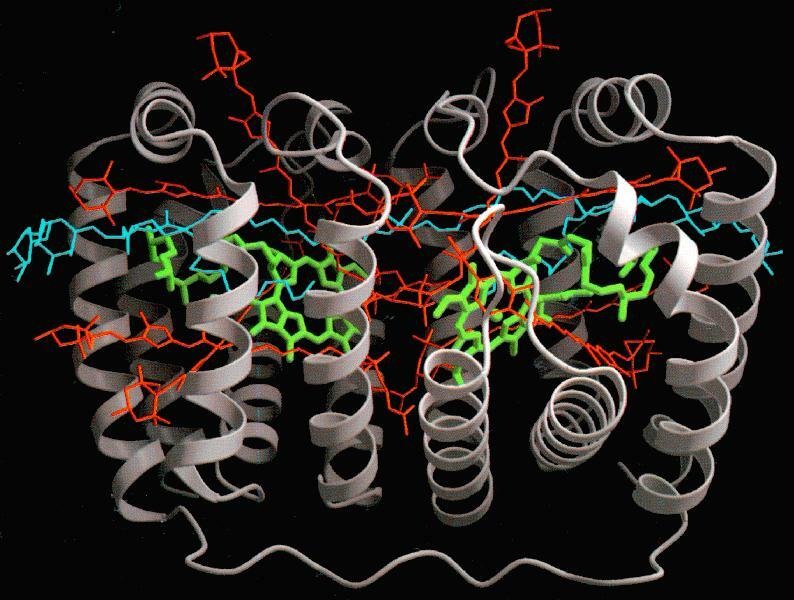 (1994) have provided the atomic level structure of LHCIIb, the major light harvesting Chla/Chlb complex of plants and green algae,; this has allowed the rationalization of the proposed mechanisms of excitation energy transfer among the Chls. In my laboratory, Xiong et al. (1996, 1998) have produced a hypothetical structural model of PSII reaction center where the two b -carotenes molecules are parallel to each other, although there is reason to believe that they may be perpendicular to each other (see e.g., Mimuro et al., 1995; Figure 12). The entire field seems to be still in its infancy and the present book should help encourage further research to unfold the relationship between the molecular structure and the molecular function of all the carotenoids. Drs. Harry Yamamoto and Barbara Demmig-Adam have provided important information on section IV of this chapter. However, all omissions and errors are mine. I am thankful to all of my current photosynthesis colleagues at the University of Illinois at Urbana for social and intellectual support. In particular, I owe deep gratitude to Drs. John Whitmarsh, Colin Wraight, Don Ort and Tony Crofts for being there for intellectual interactions. Photosynthesis training of graduate students and post-doctoral associates at Urbana was recently supported by NSF DBI 96-02240. Björkman O (1987) High irradiance stress in higher plants and interaction with other stress factors. In: Biggins J (Ed) Progress in Photosynthesis Research, Volume 4, pp 11-18. Martinus Nijhoff: Dordrecht, the Netherlands. Britton G and Goodwin TW , eds. (1982) Carotenoid Chemistry and Biochemistry. Pergamon Press, Oxford, UK. Emerson R and Arnold WA (1932a). A separation of the reactions in photosynthesis by means of intermittent light. J. Gen. Physiol. 15: 391-420. Emerson R and Arnold WA (1932b) The photochemical reaction in photosynthesis J. Gen. Physiol. 16: 191-205. Emerson R and Rabinowitch E (1960). Red drop and role of auxiliary pigments in photosynthesis. Plant Physiol 35: 477-485. Rabinowitch, E.(1945) Photosynthesis and Related Processes. Vol. I. Chemistry of photosynthesis, chemosynthesis and related processes in vitro and in vivo. See scheme 7.V on p. 162. Interscience Publishers Inc., New York. Siefermann-Harms, D and Ninnemann, H (1982) Pigment organization in the light- harvesting Chl-a/b protein complex of lettuce chloroplasts. Evidence obtained from protection of the Chls against proton attack and from excitation energy transfer. Photochem Photobiol 35: 719-731. Wackenroder H W F (1831) Üeber das oleum rad. Danci aethereum, das Carotin, den Carotlenzucher und den officinellum succus Danci. Mag Pharm 33: 144 et seq. Willstäedt H (1934) Carotinoide, Bakterien- und Pilzfarbstoffe. Stuttgart. Figure 1. Separation of leaf carotenes and leaf xanthophylls by chromatographic adsorption, obtained in 1938 by Harold Strain is illustrated above. I. Separation of a carotene from b carotene by adsorption of petroleum ether extracts of leaves on a magnesia column. II. 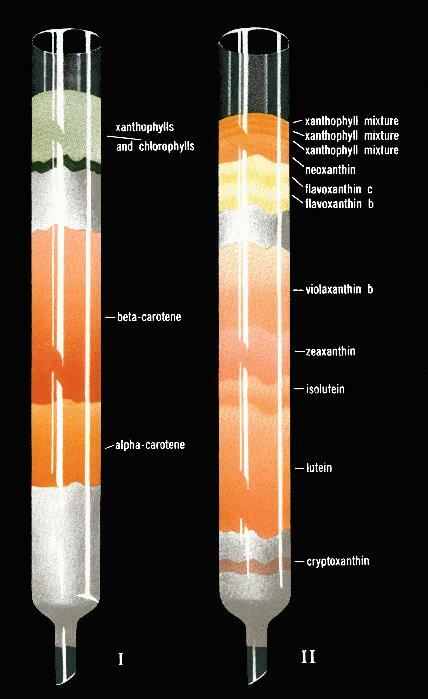 Separation of leaf xanthophylls by adsorption of a dichloroethane solution of these pigments on a magnesium column; note the separation of violaxanthin, zeaxanthin and lutein, mentioned in the text. The figure is taken from Strain (1938, p. ii, frontpiece). Figure 2. Franck Condon principle as applied to carotenoids. The photograph of James Franck, the co-discoverer of the principle is shown as an inset, and was taken by the author in 1963 when Franck attended the Airlie House Conference on "Photosynthetic Mechanisms of Green Plants", organized by Bessel Kok and Andre Jagendorf. Figure 3. The first detailed quantum yield action spectra of oxygen evolution in the green alga Chlorella pyrenoidosa, obtained by Emerson and Lewis (1943) using Warburg manometry. Nineteen sets of experiments were made and the phenomenon of the red drop (drop in the quantum yield of oxygen evolution, beyond 680 nm) was discovered; this later led to the discovery of the two pigment system and two light reaction scheme when Emerson and co-workers discovered the Enhancement effect in 1957 (Emerson et al., 1957). The dip in the blue (minima at 490 nm) was due to only 40-50% efficiency of excitation energy transfer from from the carotenoids to Chl a. The experiments were done at the Carnegie Institution of Washington at 290 Panama Street, Stanford, California, using a grating monochromator assembled by Emerson and Lewis themselves. The minimum quanta of light needed to evolve one molecule of oxygen approached 10 in these experiments. Also shown as inserts are the photographs of late Robert Emerson (in 1958) and the late Charleton M. Lewis (in 1996) taken by the author. Figure 4. The quantum yield action spectra of oxygen evolution in the diatom Navicula minima obtained by Tanada (1951), then a doctoral student of Robert Emerson at the University of Illinois, Urbana, Illinois, using the Emerson-Lewis monochromator and Emersons perfected Warburg manometry. Here, the existence of the "red drop" (beyond 680 nm) was confirmed, but more importantly, the almost 80-90% efficiency of fucoxanthin absorbing in the blue to green region was established. Further, the minimum quantum requirement of oxygen evolution (inverse of the maximum quantum yield of oxygen evolution) was found to be 8. It was the same instrument, located in the 155 Natural History Building at Urbana, that was used later for the finding that fucoxanthin was a major sensitizer in the then-called "short wave" system (now PS II), whereas the Chl a absorbing beyond 680 nm was in the then-called "long wave" system (now PS I) ( see Emerson and Rabinowitch, 1960; Govindjee and Rabinowitch, 1960). Figure 5. 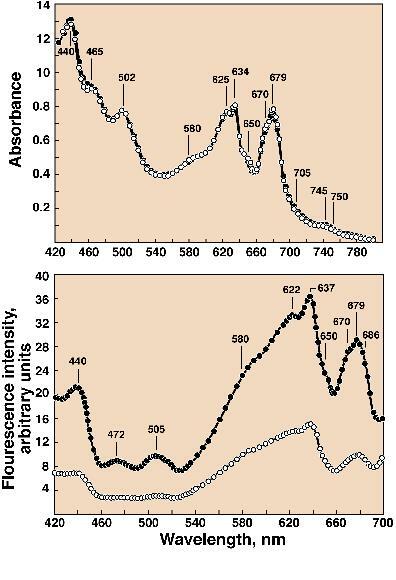 Absorption spectra (top panel) and action (or excitation) spectra of Chl a fluorescence measured at 725 nm (bottom panel ) at cryogenic temperatures (open circles, 4K; closed circles, 77K) in Chlorella pyrenoidosa. In addition to Chl a bands (440 nm, 670-672 nm, and 678-679 nm) and Chl b bands (477 nm and 649 nm), a carotenoid band at 491 nm in both absorption and spectra and action spectra of fluorescence was observed. This experiment was done at the University of Illinois at Urbana, Illinois, by my PhD student Frederick Yi-Tung Cho (Cho and Govindjee, 1970a). Figure 6. Absorption spectra (top panel) and action (or excitation) spectra of Chl a fluorescence measured at 715 nm (bottom panel ) at cryogenic temperatures (open circles, 4K; closed circles, 77K) in the blue oxygenic bacterium Anacystis nidulans . In addition to Chl a bands (440 nm, 670nm, and 679 nm) and phycobilin bands (580 nm, 622-625 nm, 634-637 nm, and 650 nm), carotenoid bands at around 470 nm and 502-505 nm were observed in both absorption and action spectra of fluorescence. However, the calculated efficiency of excitation energy transfer from the carotenoids to Chl a was much lower than in the green algae (Cho and Govindjee, 1970b). Unknown to the author at that time, Goedheer (1969a,b), in Utrecht, the Netherlands, had observed similar bands at 471 nm and 504 nm (at 77 K) in the action spectra of several algae that were specially treated; Goedheer concluded that these bands were from b carotene, and that they transferred energy with 100% efficiency to Chl a, whereas there was no energy transfer from the xanthophylls to Chl a. Figure 7. 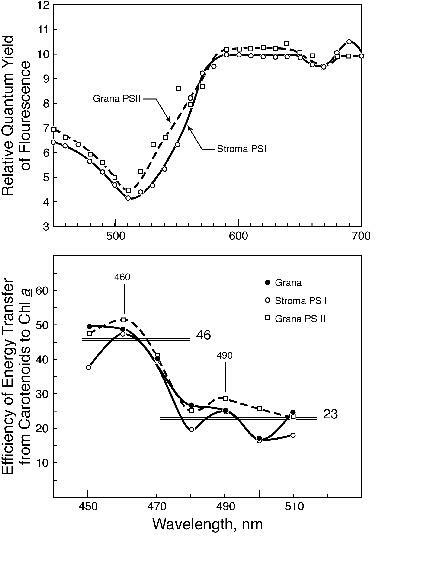 Action spectra of (relative) quantum yield of Chl a fluorescence measured at 740 nm, at 77K, in grana and stroma lamellae (top panel) showing the relative inefficiency of excitation energy transfer from the carotenoids (the blue region) to Chl a in both the systems. Using the methods and assumptions of Emerson and Lewis (1943) and of Duysens (1952), the efficiency of energy transfer to Chl a was calculated (bottom panel). The data were suggestive of two pools of carotenoids, one absorbing in the short wave region and transferring energy with 40-45 % efficiency, and the other in the longwave region and transferring energy with only 20% efficiency (after Gasanov et al., 1979). No firm conclusions are available. Further research is necessary to investigate the light harvesting and energy transfer capabilities of not only carotenoids as a group, but of individual carotenoids in PS I and II. Figure 8. A cartoon for the arrangement of four protein complexes in the thylakoid membrane. Also shown, in cartoon form, is the creation of membrane potential as the electrons are transferred from the inner side of the membrane to the outerside of the membrane during primary charge separation in both photosystems I and II. It has been suggested that carotenoids, along with other pigments, sense this membrane potential through electrochromism leading to a 515 nm absorbance change (D A 515) (see inset). The four major protein complexes, embedded in the thylakoid membrane, are used for the production of the reducing power NADPH and ATP, both needed for the fixation of CO2 and the production of glucose. These complexes are: Photosystem II (PSII, that oxidizes water to oxygen, reduces a plastoquinone molecule, and releases protons in the interior of the thylakoid membrane, and is also called water-plastoquinone oxido-reductase); Cytochrome b/f (Cytbf) complex (that oxidizes reduced plastoquinone, reduces a copper protein plastocyanin (PC), and releases protons in the interior of the thylakoid membrane, and is called plastoquinol-plastocyanin oxido-reductase); Photosystem I (PSI, that oxidizes reduced plastocyanin and reduces NADP+, to NADPH, and is called plastocyanin-ferredoxin oxido-reductase); and ATP Synthase (that uses the membrane potential and the proton gradient to produce ATP from ADP and inorganic phosphate). The membrane potential is formed and electron transport takes place when photosynthesis is simultaneously powered by light absorbed in both PS I and II leading to electron transfer from the inner side of the thylakoid membrane to the outer side of the membrane; this makes one side of the membrane more negative than the other. The reaction center Chls P680 (in PS II) and P700 (in PS I) are located on the inner side of the membrane. Photosynthesis starts by simultaneous excitation of P680 and P700. Excited P680 (P680*) and P700 (P700*) have energy resulting from light absorption. An electron is transferred from P700* to Ao (another special Chl a molecule) producing oxidized P700 (P700+) and reduced Ao (Ao-). At about the same time, an electron is transferred from P680* to a pheophytin (Pheo) molecule producing oxidized P680 (P680+) and reduced Pheo (Pheo-). These are the only steps where light energy is used to produce oxidation-reduction energy. The rest of the reactions are energetically downhill. P700+ reduced to P700 by receiving an electron that originates in Pheo-, and is passed on to P700+ via the following intermediates: from Pheo- to QA (a bound plastoquinone), to QB (another bound plastoquinone) to PQ (freely mobile plastoquinone) to an iron sulfur protein (FeS), to a cytochrome (Cyt f), to a freely mobile plastocyanin (PC), and finally to P700+. On the other hand, an electron on Ao- is passed on, ultimately, to the NADP+ via several other intermediates (A1, a phylloquinone, Fx, FA and FB, three iron-sulfur proteins, and Fd, ferredoxin). The missing electron on P680+ is recovered, ultimately, from water molecules via an amino acid tyrosine (D1-Y-161, Yz) and a manganese complex (Mn). Four such reactions (utilizing a total of 8 photons, 4 in PSII and 4 in PSI) are required to oxidize H2O to 102 and reduce 2 NADP+ to 2NADPH. Carotenoids are. not known to play any role in the electron transport pathway of photosynthesis. Figure 9. 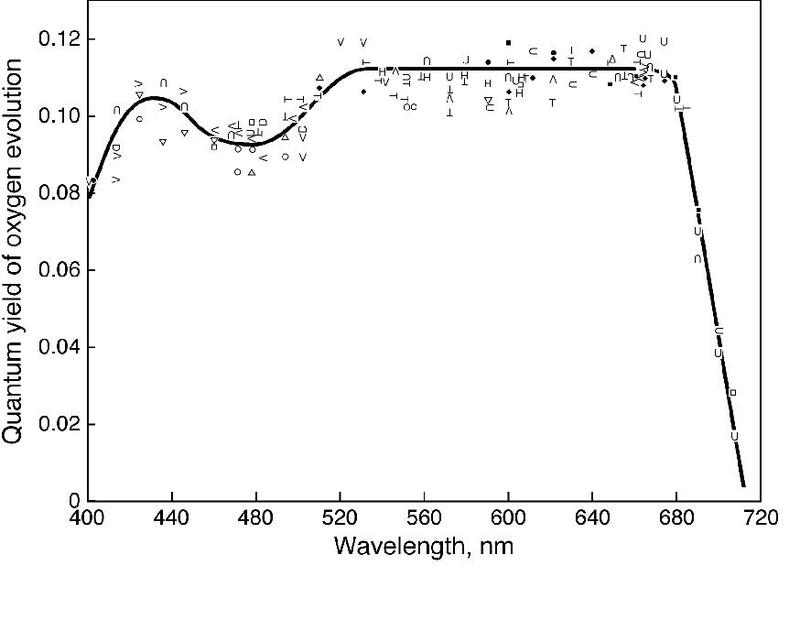 Change in absorption spectrum of a Chlorella suspension upon irradiation with red light. This experiment, published by Duysens (1954), was done at the Carnegie Institute of Washington at Stanford, California. The 515 nm change was later associated with a shift of absorbance of some carotenoids, among other pigments, to longer wavelengths. Further, this change, on a nanosecond time scale, was shown to monitor the membrane potential component of the proton motive force created in the thylakoid membrane (also see Figure 8). Inset shows a 1963 photograph of L.N.M. Duysens. Figure 10. One of the several schemes used to explain the mechanism of photoprotection by xanthophyll cycle pigments. It is suggested that, at high light intensities, when photosynthesis is saturated, there are excess protons in the lumen of the thylakoid (see Figure 8) and these have a double function: (1) they protonate minor antenna complexes of PS II leading to the activation of a binding site for xanthophylls (see right side of the diagram); and (2) they activate de-epoxidase allowing the conversion of violaxanthin into antheraxanthin and then into zeaxanthin (see left side of the diagram). The two events together then lead to the quenching of Chl a fluorescence through dissipation of energy as heat. The scheme shown here was modified from Gilmore and Govindjee (1998). Figure 12. A diagrammatic model of the arrangement of two carotenes (labeled as carotenoid 489 and carotenoid 507) in the reaction center molecule of PS II. 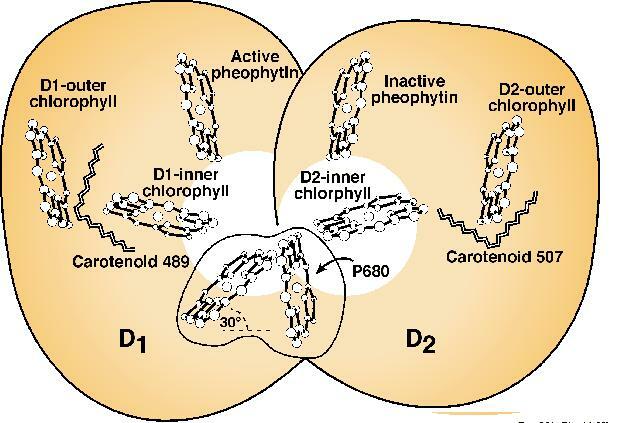 P680 is the reaction center Chl a dimer, whereas D1 and D2 are the two proteins where the chromophores are housed. The scheme shown here was modified and adapted from Mimuro et al. (1995). For a more complete model of Photosystem II reaction center and a different view of the arrangement of carotenoids, see Xiong et al. (1998).